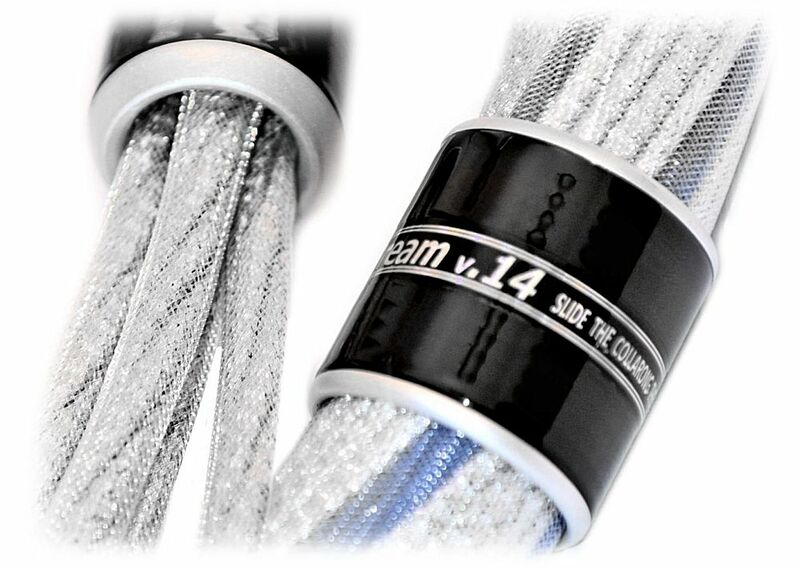 The "Dream V14" is the newest - and the best up-to-date (2014) revision of the STEALTH Dream family of loudspeaker cables (excluding only the separately standing flagship Dream Royale). 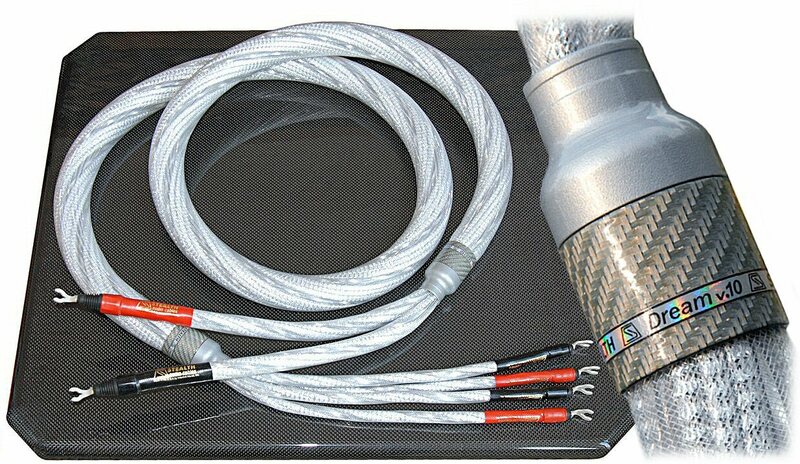 This is the first ever STEALTH loudspeaker cable featuring variable cross-section along the cable (STEALTH VariCross) - designed to improve impedance matching between the source (power amp) and the receiving end (loudspeaker) - which considerably improved midbass and deep bass performance, without any compromise whatsoever in the midrange and treble definition and clarity. The diameter of the conductive core varies along the length of the cable, while the outer diameter of the jacketed cable remains the same, and thus the cross-section of the cables changes along the cable. This technique - which is absolutely impossible to make using a machine, and quite difficult to make by hand - is worth the effort because it dramatically improves the cable resonance characteristics and behavior via effectively lowering the "Q" at ALL resonance frequencies - which results in a better overall tonal balance, lower any coloration of the sound, and improves perceived clarity. 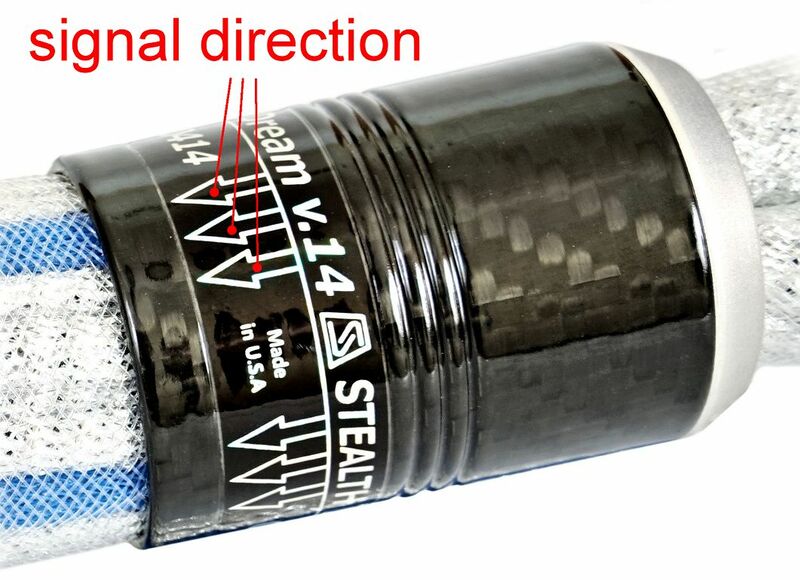 Because of it's new geometry (STEALTH VariCross), the Dream V14 cables are DIRECTIONAl! 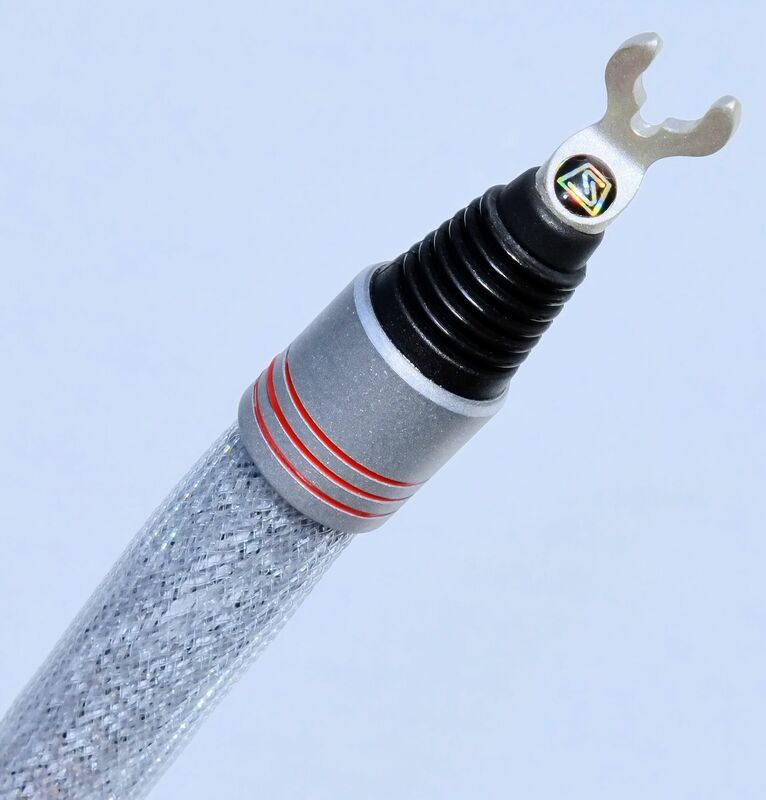 The Dream V14 loudspeaker cables are the first in the STEALTH cable line to feature our new for 2014, completely redesigned solid silver spade lugs - or our solid silver banana plugs. We also added a sliding tuning collar - our best and very effective innovation for the year of 2014. 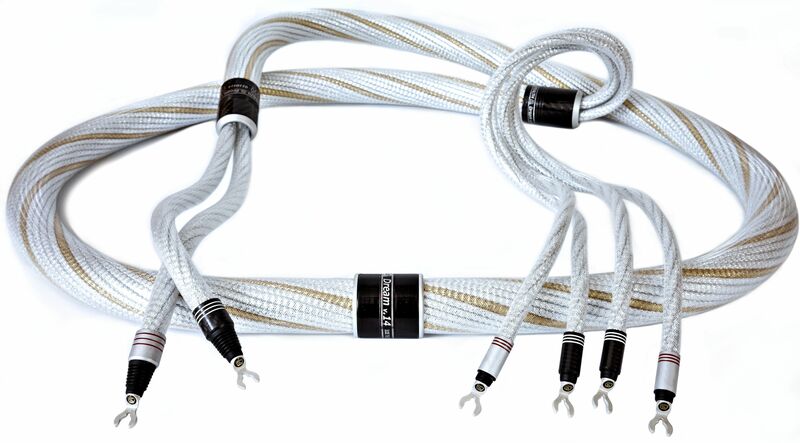 Moving this collar along the cables allows fine-tune the sound, and it really works! 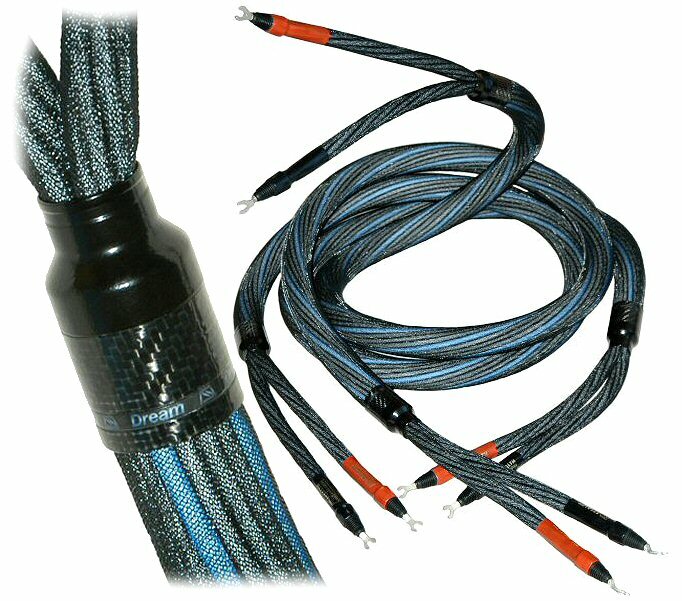 The initial position of the collar is approximately 27 to 30 inches from the power amplifier (the transmitting end of the cable). The optimal position of the tuning collar is system-dependent. 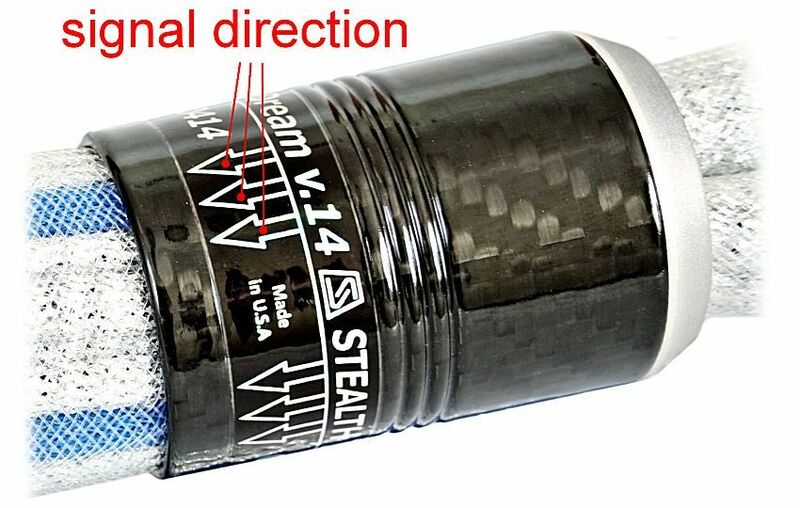 It is recommended to fine-tune the Dream V14 after it is broken-in (i.e. 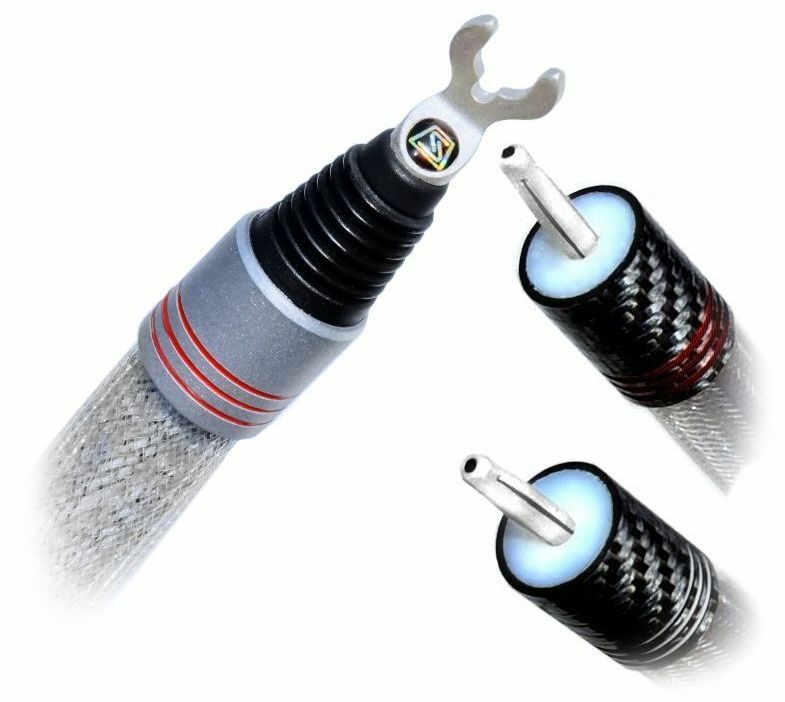 approximately two weeks after its installation in a system) - moving the tuning collar along the cable for find the best clarity and naturalness of the sound. 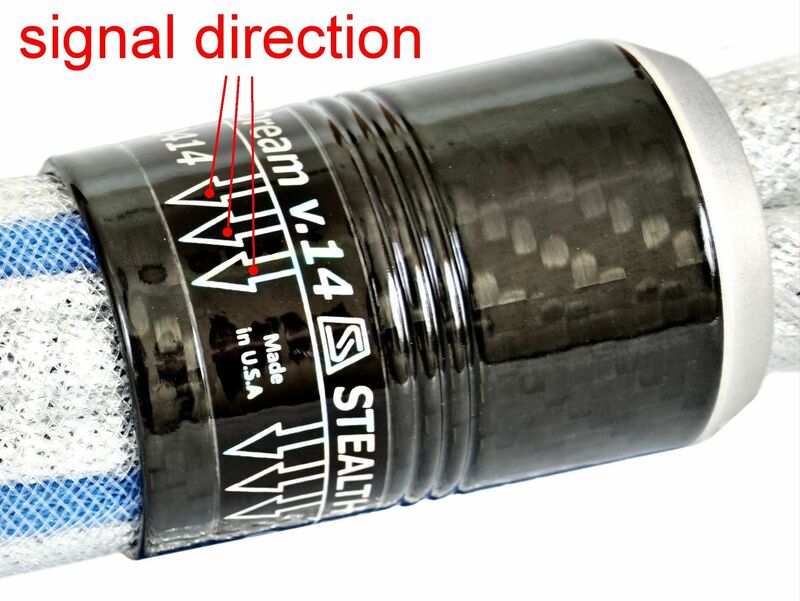 Our tests show that on a high-resolution system with high quality digital units moving the tuning collar along the Dream V14 creates clearly audible changes in sound, and with careful tuning the sound quality with the Dream V14 surpasses the original Dream and the Dream V10 by a considerable margin - specifically in the deep bass and midbass regions. The Dream V14 loudspeaker cables have been in testing since early 2013; several pairs were built in the color code shown below (silverish-white with blue stripes). No other changes, except for the color - have been made in the released (production) Dream V14. 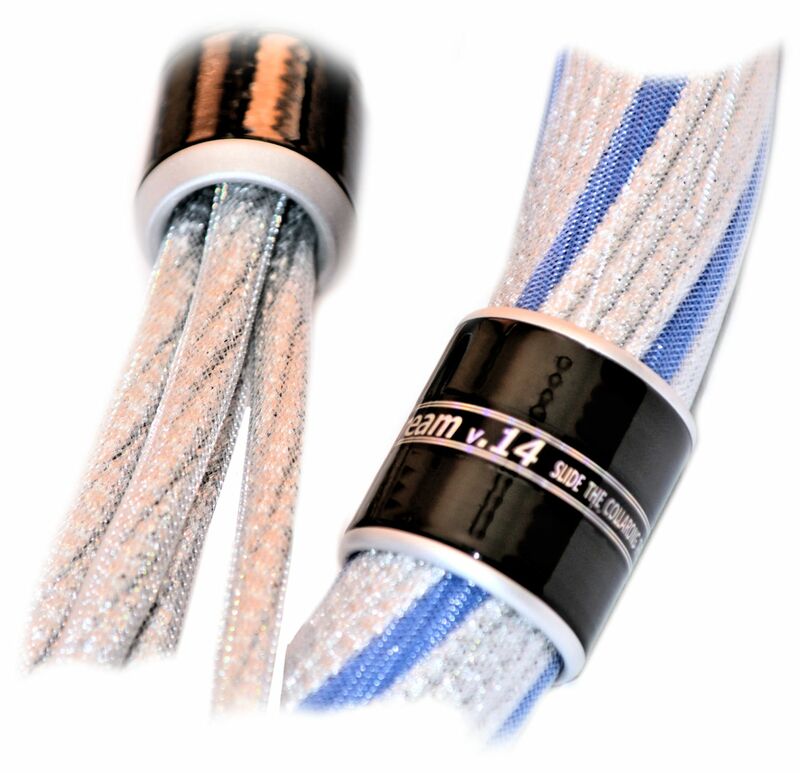 While the size (overall diameter) of the Dream V10 (revision 2010) is the same as the standard Dream, the color is silver (with four transparent spiral stripes that go along the cables), and most importantly, the new version offers a number of improvements. 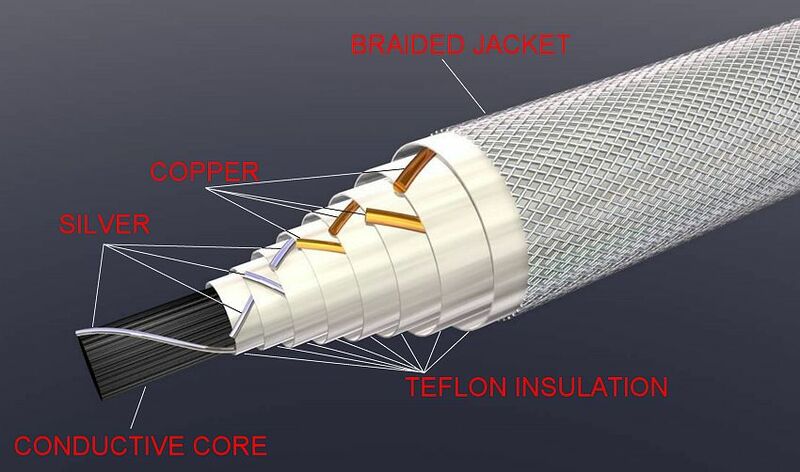 Inside wire bundles, we added a new core for all wire bundles. This new core is conductive, carbon fiber-based; the idea of this new core came from our experimentation with pure carbon speaker cables. 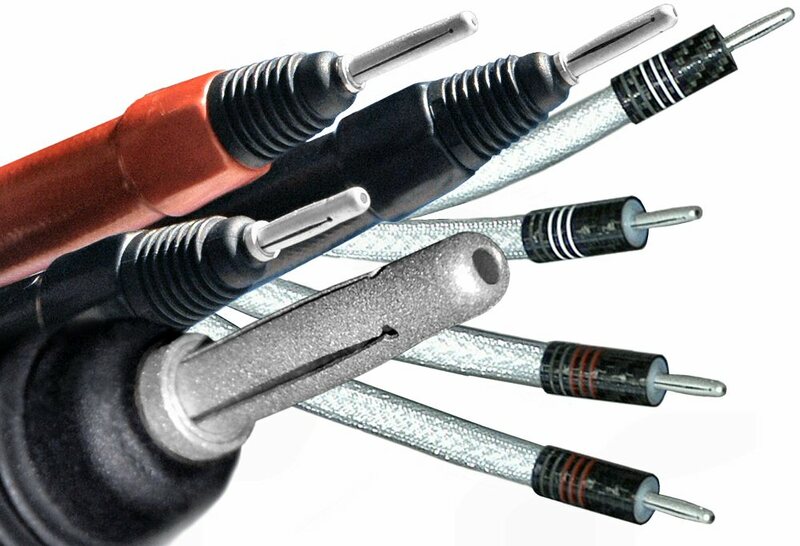 The pure carbon speaker cable prototypes that we made and auditioned were very thick: several inches in diameter; the pure carbon speaker cables sound VERY different, compare to the conventional, metal-based cables: the soundstage is much deeper and absolutely 3-D. Unfortunately, our carbon prototype is tonally incorrect, and thus we won't be releasing it any time soon. However, in the Dream V10, in same dimensions as the standard Dream, replacing the non-conductive core with a carbon fiber based - i.e. conductive - we have been able to get a better soundstage. 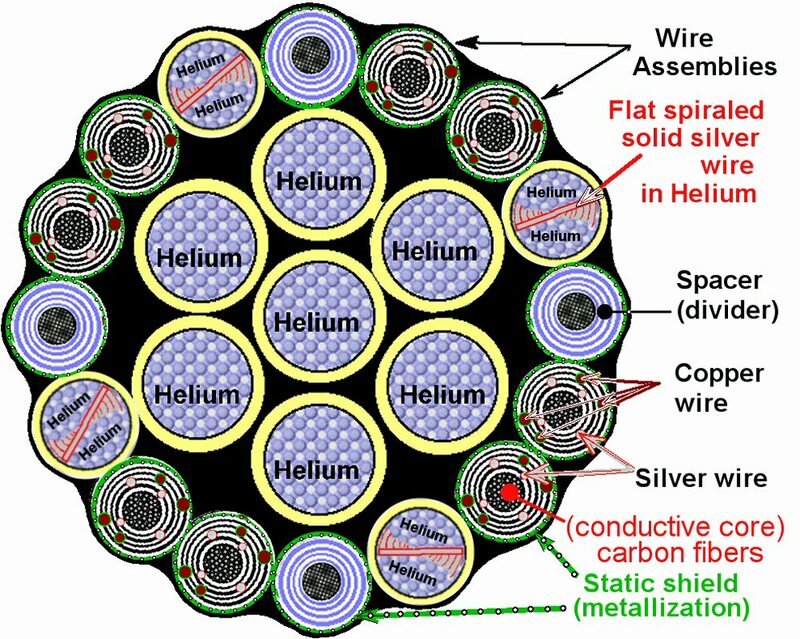 To compensate for the (unwanted) tonal balance shift, we replaced 1/3 of the original wire assemblies with a flat solid silver AND directly immersed in Helium, and added a static shield between the wire bundles. As the result, the tonal balance of the Dream V10 is similar to the Dream, with noticeably improved - "livelier", tighter bass, better transient response, and improved immediacy of its sonic presentation. 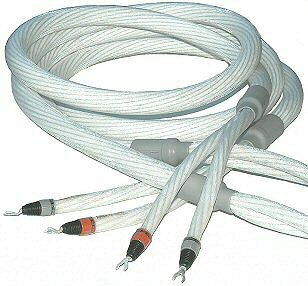 The Dream V10 - as the standard Dream - stereo set consists of two thick, round cables - which are 35 mm (1.37 inch) in diameter. The cables split at the ends into positive and negative runs. 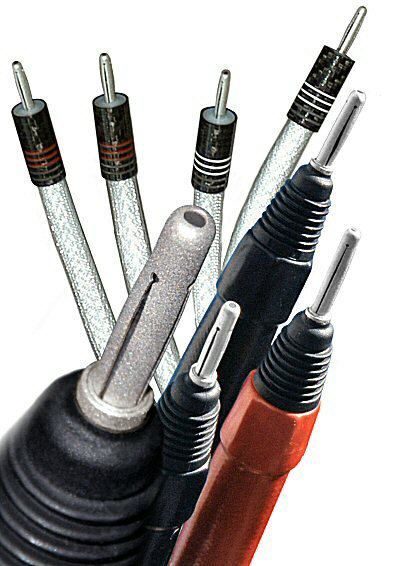 Each hybrid wire assembly is 6.35 mm (1/4 inch) in diameter, made of 8 individually insulated solid core wires in our proprietary non-resonant distributed LITZ configuration; two different thicknesses (gauges) of 99.999% pure solid core copper, and two different gauges of 99.997% pure solid core silver are used - per each wire assembly. 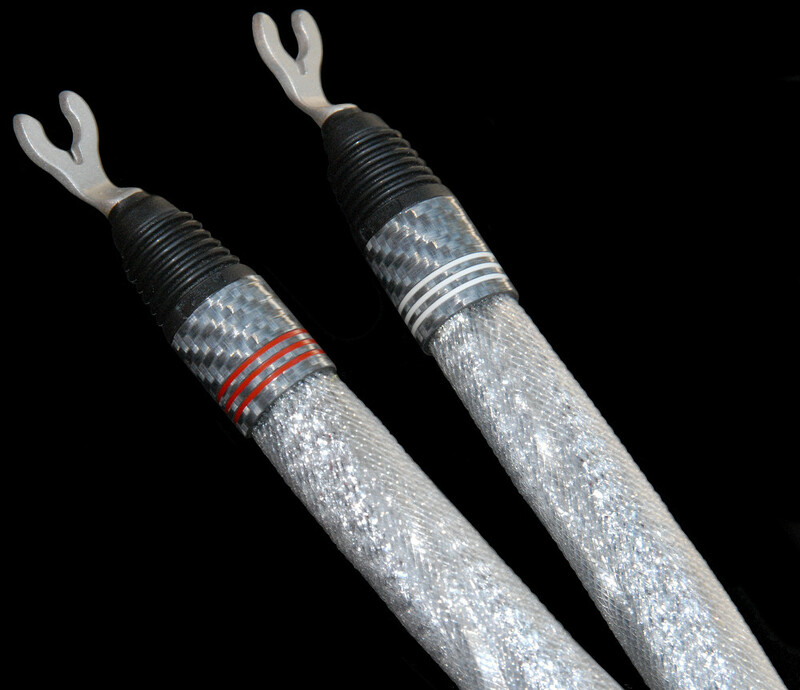 The wire assemblies are wrapped around a hollow, flexible para-vacuum* center multi-core (flexible Helium-filled tubing). Three wire assemblies being run side-by-side create wire bundles (triple runs). Therefore, there are four wire bundles (triple runs) in each Dream cable. The four wire bundles (triple runs) are separated by four blue foam Teflon dividing runs (spacers). 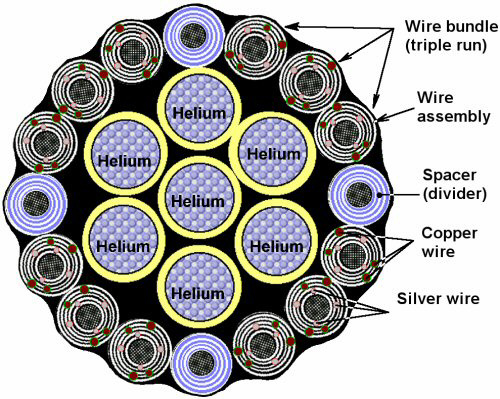 The spacers have the dame diameter as the wire assemblies, i.e. 6.35 mm (1/4 inch). 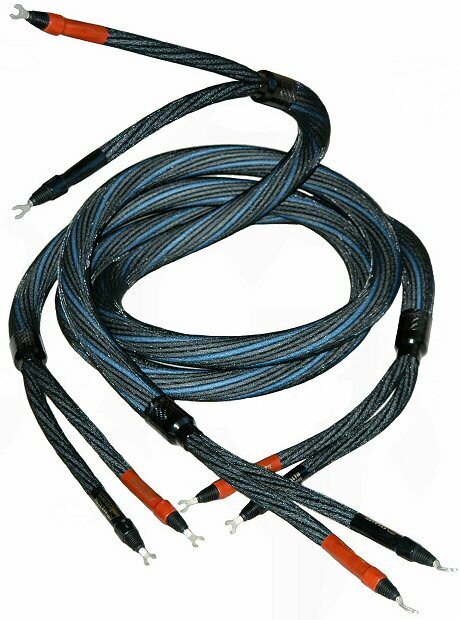 The four triple runs (wire bundles) are being run individually for internal bi-wire. For single wire, two triple runs being run in parallel make a positive run, and the other two make a negative run. 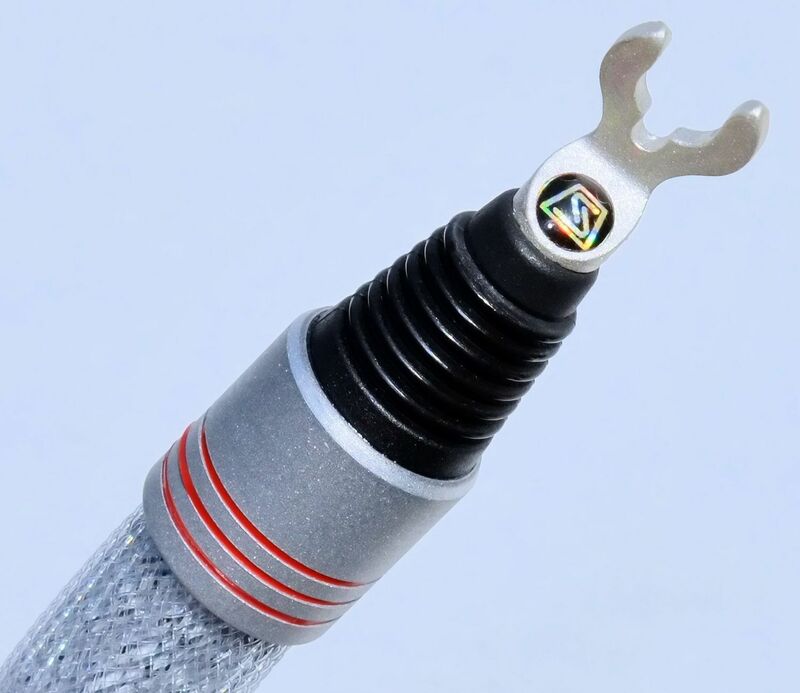 Thicker and sturdier, redesigned STEALTH solid silver spade lugs, sandblasted with glass spheres for improved contact. Optional - newly designed solid silver STEALTH proprietary banana plugs: easy to insert, but tight (plastic spring-loaded) and virtually unbreakable (Kevlar composite insert for extra strength). Suggested retail price for the Dream V14 is $14,700 for a 2 meter pair, and $6,600 for each consecutive meter. Suggested retail price for the Dream V10 is $11,400 for a 2 meter pair, and $5,200 for each consecutive meter. Suggested retail price for the "original" Dream is $8,800 for a 2 meter pair, and $4,000 for each consecutive meter. 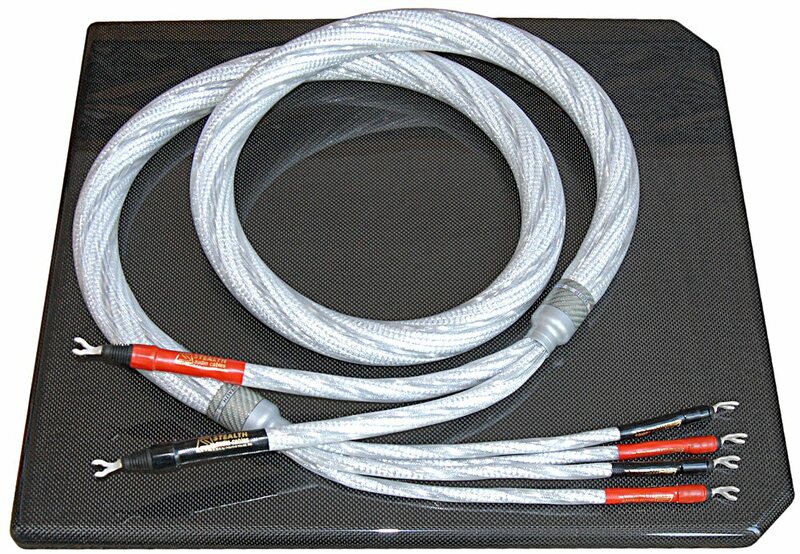 Some of the very first - beta testing - Dream speaker cables were made in white color code, as shown below. Both white (beta) and blue-black (production) versions are internally the same.